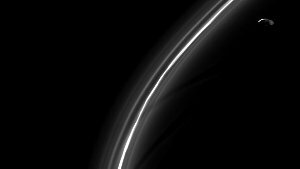 The narrow F-Ring discovered by Pioneer 11 was found to comprise as many as five individual strands. On either side of the F-Ring, two small satellites keep the ring particles confined to their orbit by gravitational forces. These satellites are thus known as the "shepherd satellites." 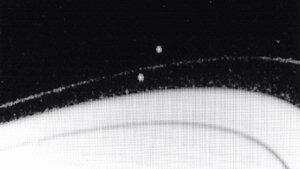 The Voyager 2 image at right shows the F-Ring and its two shepherd satellites. Each satellite has a different orbital period, and the inner one passes the outer satellite every 25 days. 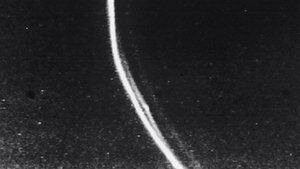 Individual strands of the F-Ring give it a braided appearance as seen by Voyager 1. The widest areas are clumps of ring material, and may contain tiny moons. The ring here is about 35 kilometers (25 miles) wide. The small moon Prometheus (upper right) is one of the shepherding moons that shapes the F-Ring.